Analysis Archives - LABORSCIENCE A.E. In metallography, knowledge about the properties of a material play a major role today in research, design, manufacturing and quality assurance. 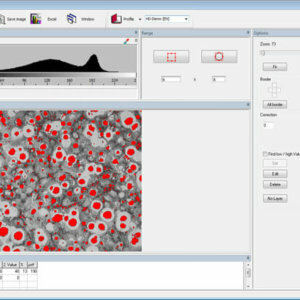 Image analysis methods are often used to obtain key data. The microscopically captured micrographs are detected, classified and differentiated, tagged, marked and visualised using the analysis tools of the dhs Image Data Base according to various standards. Depending on the material and method of preparation, eight software modules are available. A wide variety of application options can also be found under Applications. 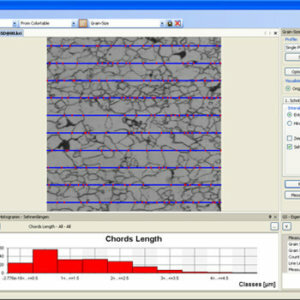 Standard compliant determination of grain size by image analysis. The dhs analysis module grain Size uses greyscale determination to detect the particle grain sizes contained in the structure via the "linear intercept method". This method is used for single-phase-ferrite and two-phase-ferrite/perlite structures, and for colour etchings. To obtain meaningful results, you can analyse several micrographs or subsections of a specimen. The results are collected and shown in a freely configurable results table. The standards-compliant evaluation is performed as per DIN EN ISO 643 and ASTM-A247. Client-side settings can be saved in profiles to generate reproducible analyses. For percental phase determination of materialographic specimens. The dhs analysis module Area Detection uses greyscale detection (phase analysis) to enable automatic detection, calculation and visualisation of area ratios. The different colours of the image (structural constituents) are converted into greyscale values and analysed in up to 6 phases or layers (entire image or a pre-selected section). Client-side options such as greyscale range, phase designation, border correction, etc., as well as a directly linked, automatic MS Excel™ evaluation, enhance the performance scope.